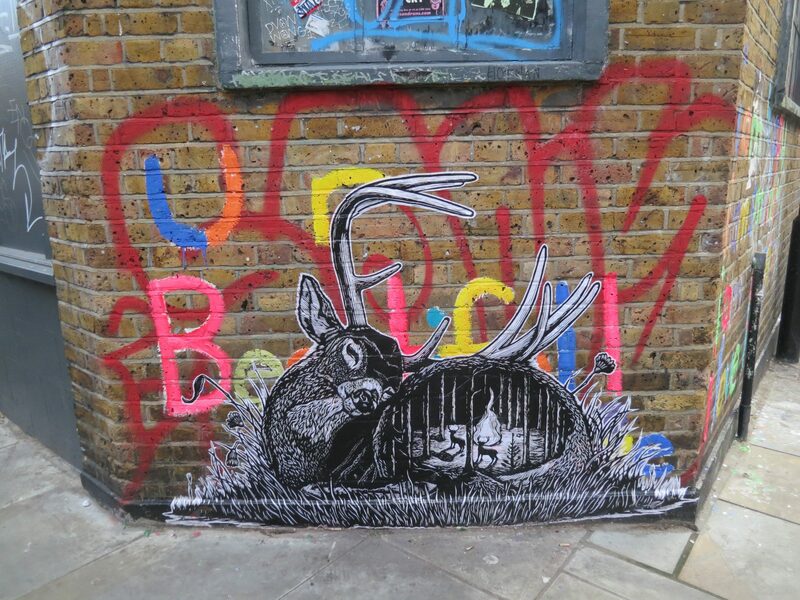 Street Art, what is it? Is it the graffiti that you see from the train? Probably not. Is it council commissioned murals? Possibly. Stencils spray-painted onto walls? Yes, but that’s not all it is. Venture east from Liverpool Street station and look around you: stickers, paintings, linocuts, sculptures and stencils all vie for your attention. Head towards Brick Lane via Brushfield and Fashion Streets. Take a look at the lampposts; many are festooned with stickers that act as calling cards for visiting artists. 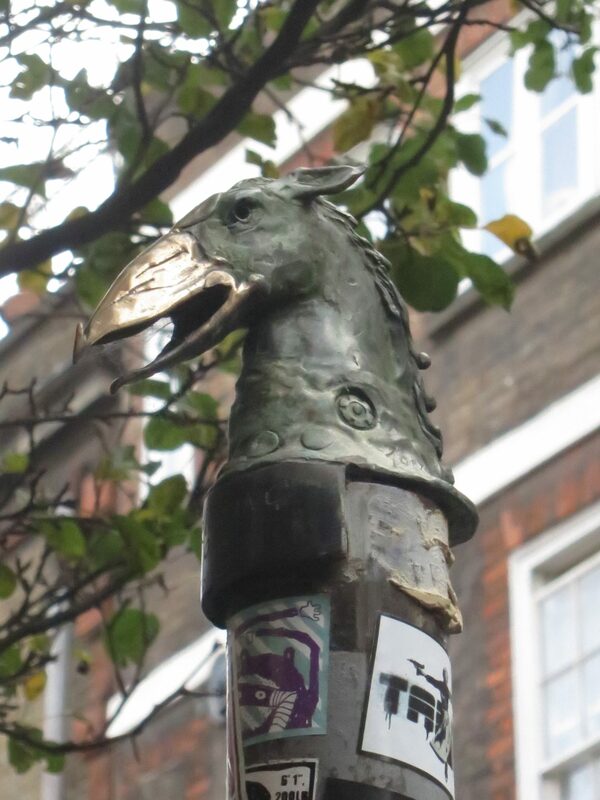 Don’t forget to look on top of the post as some are topped with sculpture; this bird is by Jonesy and can be seen on Princelet Street. Lots of the street signs on Brick Lane have spray-painted men on them transforming them into sources of witty amusement. Keep an eye out for plaster heads affixed to walls, these are the work of French artist Gregos. My favourite was this rather fine linoprint of a deer by Fusca. As it is down at pavement level, chances are that it has been either changed or painted over by now. Wandering around and just looking is fine but taking a walking tour makes you realise the vast diversity of work on show. 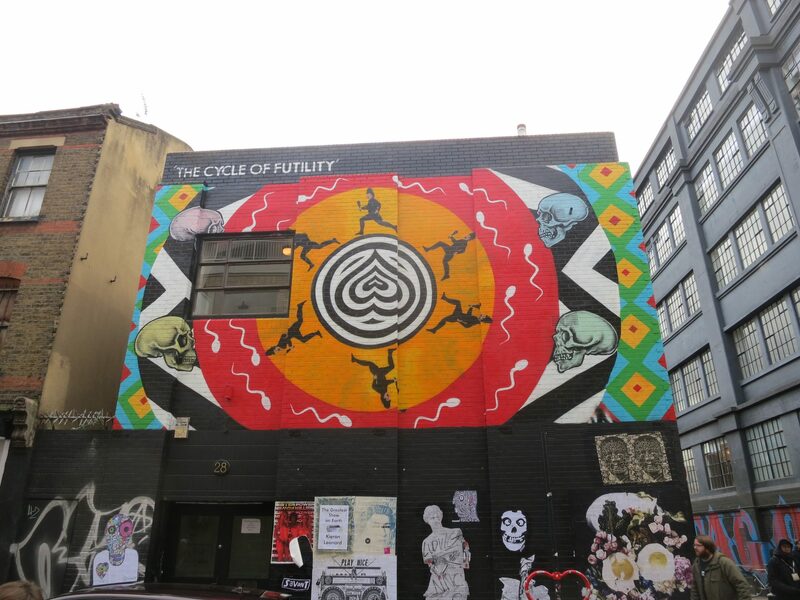 Shoreditch Art Tours was the name that I picked at random. Dave was an excellent guide and £15 a fair price. Since my tour with him, I have been back with the Junior CW’s and friends for a more leisurely stroll. Without Dave I would not have known to download the Gif-iti app onto my phone. INSA (the artist) created this work that looks neat and accomplished but viewed via the app it comes alive and is amazing. Curry is no longer the staple dish of Brick Lane. There are all manner of coffee and chocolate shops that have popped up. My own favourite is Joe’s Kid on Fashion Street with its own Jimmy C mural. Certainly more than in most small villages!